Alternative singer-songwriter Liam Oragh brings his new album – The Arguments against Insanity – which includes the singles Oblivious and Lake Louise – on tour for a hometown gig in The Workman’s Club, Dublin on Friday March 2nd – the follow up to his Jackie Hayden Hot Press Pick-of-the-Fortnight Award-Winning Debut album – Only 2 late if You’re dead – and best known for his catchy quirky song ‘Hey Nelson’ about wanting to inherit Nelson Mandela’s shirt collection -Support on the night from Maul Park and Paul O’Toole plus special guest Gillian Hamill. Best known for his catchy quirky song ‘Hey Nelson’ about wanting to inherit Nelson Mandela’s shirt collection, Alternative singer-songwriter Liam Oragh’s new album – The Arguments against Insanity – the follow up to his Hot Press Pick-of-the-Fortnight award-winning debut album – Only 2 late if You’re dead – has just been released. Songs about madness, songs about life, love, getting older, and cryogenically cheating death (‘Thaw me out when you can cure me’) – with stop offs along the way that include his topical single – Oblivious – about how we’re all walking around with our heads stuck in our mobile phones – and Lake Louise – about getting chased by a grizzly bear in the Canadian Rockies, and 12 Monkeys – about wanting to check himself into a notorious mental institution, not forgetting the album’s opening screamer ‘Not Guilty by Reason of Insanity’. Who needs therapy when you’ve got music! “The album sees Liam Oragh alternately channeling the musical stylings of Jonathan Richman, John Cale, Lou Reed et al with his own inimitable aplomb. The album is infused with humour, hints of punkiness, shades of Americana and just plain musical goodness despite the darkness contained within the lyrics. 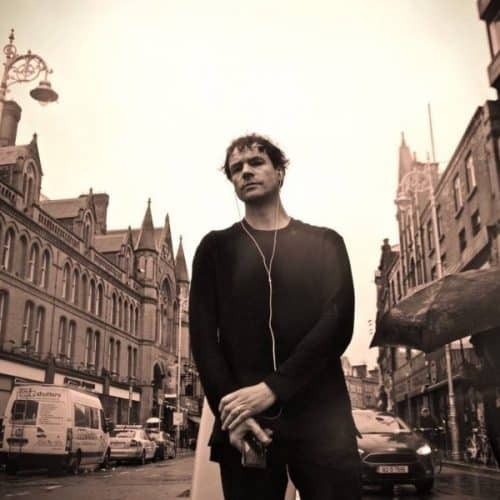 If you like your singer-songwriters quirky then Liam Oragh is yer man.” Ralph’s Life Indie Music Blog and Radio KC Indie Show.